Permanently network unlock your i-mate online fast and safe. Switch freely between network carriers. Avoid roaming fees when traveling abroad. How to unlock my i-mate phone with doctorSIM? Once you've requested your unlock code, you will receive simple step-by-step instructions explaining how to complete the unlocking process. Your i-mate cell phone will then be permanently unlocked for use on any compatible GSM network. Is it legal to unlock an i-mate cell phone from its network? Our method of unlocking phones by IMEI is completely legal. In fact, this method is the only method recommended by the phone manufacturers and network providers themselves as it will neither harm the software/hardware nor void the cell phone's warranty. Why should I unlock my i-mate with doctorSIM and not at a local store? Because it is less expensive and more convenient! No store can compete with our prices and you can unlock your cell phone yourself from the comfort of your home without having to leave it at the store for a few days. Why should I unlock my i-mate cell phone? There are many benefits to owning an unlocked cell phone, with the main advantage being substantial long-term savings. With an unlocked phone, you'll be able to benefit from better rates and never have to pay roaming surcharges when using your cell phone in a foreign country. An unlocked cell phone is also worth more money if you ever want to sell it at a later date. What is the IMEI number of my i-mate? To obtain the IMEI number of your i-mate type *#06# into the phone's keypad. Your 15-17 digit code will appear on the screen. We just need the first 15 digits to unlock your cell phone. Do not use the IMEI number printed on the packaging or receipt as it may not be correct. Can I unlock my i-mate if under contract? Yes, you can, however, network unlocking a cell phone does not cancel the contract. Even though you will be able to use your unlocked i-mate on any compatible GSM network in the world, you will still have to pay your monthly bills until your contract expires or by paying a fee to cancel it. If I unlock my i-mate will it work on every network in the world? 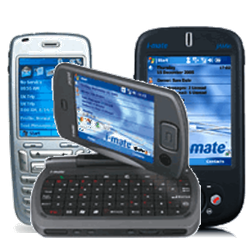 You'll be able to use your i-mate on any compatible GSM network in the world as long as it has not been blacklisted by the original operator due to loss, theft or unpaid bill. It will not work on carriers using CDMA technology. If you suspect your i-mate has been reported, remove all doubt with our free i-mate Blacklist Check. My i-mate is on the blacklist. Can doctorSIM unlock it for me? doctorSIM's unlocking services only network release phones locked to one carrier and cannot remove them from the blacklist. You must contact the network carrier that reported the cell phone to resolve the issue. Unlock codes valid for international travel to any country. Avoid unnecessary delays with your carrier. Convenience! Release your i-mate from the comfort of your home. Customer support specializing in unlocking phones. Comprehensive help center and troubleshooting guidelines.